Many consumers refer to all artificial grass products as astro turf but this is actually a brand name to which we have no association. This page explains the history of AstroTurf. 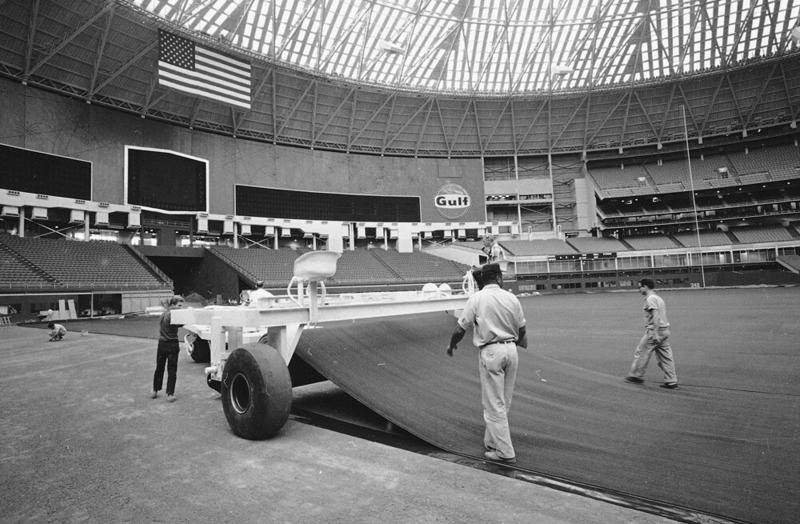 Artificial grass was first used at the end of the 1960s in the Houston Astrodome, the first covered sports stadium in the USA. This type of artificial grass was named Astroturf, after the stadium. The objective was to create a sports playing field that was as functional as possible; functionality and not the look and feel of the turf was the key factor. Apart from being green, the playing field did not resemble natural grass in any way at all. In the 1980s, a new type of artificial grass for sports made from polypropylene (PP) yarn with a 90% sand infill was introduced. PP was less expensive than nylon. The sand infill was used to stabilise the playing surface, or, in other words, to achieve a more natural ‘ball bounce and roll’ for tennis and hockey, and it also made the artificial grass system even cheaper. The disadvantage of sand was that it acted like sandpaper on the skin when players had to make a sliding tackle and it meant that these surfaces were not suitable for football. At the end of the 1990s, the third generation of artificial grass playing surfaces was developed for field contact sports such as soccer, American football and rugby. The difference from artificial grass pitches laid the 1980s was that players could make sliding tackles without burning or grazing their skin. This was mainly due to the use of polyethylene (PE) as a raw material for the artificial glass fibres and an infill consisting of granulated rubber instead of sand, or a layered combination of both. PE was a slightly softer raw material as well as colour-fast compared to PP or PA. The artificial grass fibres were also longer, up to 70 mm compared with the 12 to 24 mm used in PA and PP playing surfaces. The sport functionality – the interaction between the player and the surface, and the behaviour of the ball – remained a key factor in the development of this type of artificial grass. Compared with the first two types of artificial grass, third-generation artificial grass looked much more like natural grass due to the longer fibres. After having worked for TenCate in the USA, Freek Verhoeven saw an opportunity for a new application for artificial grass. Until then, artificial grass was mainly used for sport fields and the grass was developed to meet technical and performance requirements. Nobody had looked into the creation of artificial grass that really looked like natural grass for the landscaping market. This new opportunity led to the set-up of Landscape Solutions B.V.,which started to developed and market this new type of artificial grass specifically designed to be indistinguishable from natural grass. The underlying philosophy was that people increasingly have less time to spend time on maintaining their gardens, yet still want the peace and tranquillity that grass provides. Research showed that people would only consider buying artificial grass for their gardens if their neighbours wouldn’t be able to tell that it wasn’t real. The first type of Royal Grass® artificial grass was made from a combination of two carefully selected hues of green, with a lighter colour giving a contrasting effect. This made the grass look less homogeneous and more natural.